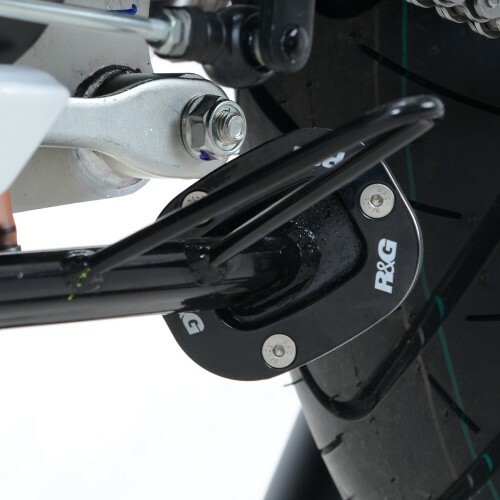 This Kickstand Shoe screws onto the bottom of the OEM sidestand, as well as the RRP Level 2 sisdestand, to enlarge the original footprint by up to 100%, significantly spreading the load placed upon it, to help prevent the stand "piercing" the ground. Despite it's enlargement, it does not affect the ground clearance, or interfere with the chain run during normal riding. Suitable for all Honda CB500X/F & CBR500R, all years. Manufactured by R&G Racing in the UK.